The price does not include the price of garage parking slot, parking place and storage roomMonthly mortgage payment in case of 20% own resources and maturity of 30 years. Calculation is indicative. 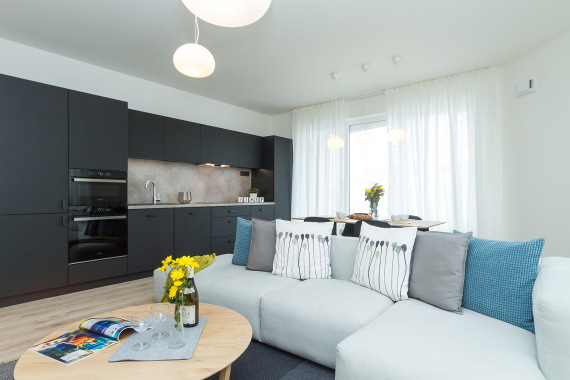 Have a look how your dream place of living in the Premiѐre can look like or arrange a tour of the model apartment and come to see it in person. Do not hesitate to contact us. We will be glad to help you. Thank you for your interest in meeting. By sending this form, I hereby confirm that the data filled by me concern my person and I grant my agreement to processing of the personal data provided by me in the scope specified in the form (i.e. particularly my name, surname, phone number, and e-mail address) for the marketing purposes of the below specified companies, including sending (or other form of contacting including telephone contacting) marketing information as well as subsequent business offers related to sale of real estates, services provided in connection with real estates, and solutions for funding of a group of real estates by means of electronic communication, SMS etc. in accordance with sec. 7 of the Act no. 428/2002 Coll., on personal data protection, as amended. I give my agreement exclusively to the company FINEP SK a.s., Jégeho 12, 821 08 Bratislava, Company Id. No. : 35 931 914, the company FINEP FS a.s., organisation unit, Jégeho 12, 821 08 Bratislava, Company Id. No. : 44 400 829, and the individuals working for them. The personal data provided by me shall not be used for any other purposes than those exclusively specified. I hereby grant my agreement voluntarily and for an indefinite period. I also declare that I am fully competent and eligible for giving my consent, and as a party concerned, I am hereby informed on my rights in accordance with section 20 of the Act on personal data protection, particularly that I am entitled to request correction of incorrect, incomplete or obsolete personal data, or their cancellation, provided the purpose of their processing has been fulfilled or law has been breached, and I am entitled to withdraw my agreement with processing of my personal data in cases when their processing does not result from law, in written form sent to the address of the company FINEP SK a.s. or the company FINEP FS a.s., organisation unit. In this document, we provide you information about your rights relating to personal data processing in the FINEP Group. While processing personal data, we comply with the legislation, in particular with the GDPR and Act on Personal Data Protection. Personal data processing always takes place in the scope of the given specific service or purpose of processing. This document will be regularly updated. We handle personal data with all due care and in compliance with the valid legislation. We provide the maximum possible level of protection for personal data using state-of-the-art equipment. Strict rules apply in the FINEP Group determining which employee or department may bes allowed access to personal data and which personal data they can process. We in principle do not pass on personal data outside the FINEP Group, with the exception of cases when we have consent to do so, when this obligation is imposed on us or in cases when the legislation or our legitimate interest allows us to do so (for example, in the case of suppliers or requests by the law enforcement authorities etc.). We only process the personal data of children (i.e. people under the age of 18) if the child was initially represented by a parent or other guardian. The high standards of personal data protection which apply to personal data processing in our group also apply to children unchanged in scope. These standards are absolutely sufficient for processing the personal data of children. As parents or other guardians of the child, you are responsible for provision of data about the child being in compliance with their interests and for informing the child about processing of their personal data by us and their rights in a comprehensible manner. If you do not agree to the method in which we process your personal data, you can take the steps listed below to protect your rights. FINEP HOLDING SE, with registered office at Havlíčkova 1030/1, Nové Město, 110 00 Prague 1, company ID number: 27927822, registered with the Municipal Court in Prague under file reference H 7 (hereinafter referred to only as “FINEP HOLDING”) is the joint administrator together with FINEP SK, a.s. with registered office at Trnavská cesta 6/A, 821 08 Bratislava, company ID number: 35931914, registered with the the District Court in Bratislava I, insert 3576/B, Section: Sa (hereinafter referred to only as “FINEP”) within the framework of the holding, with which the data subject has entered into a contractual relationship (hereinafter referred to only as “Joint Administrators”). The Joint Administrators of personal data hereby provide information about the method and scope of personal data processing, including the scope of rights of data subjects relating to processing of personal data by the Joint Administrators. The Joint Administrators process personal data in compliance with Regulation (EU) 2016/679 of the European Parliament and of the Council of 27 April on the protection of natural persons with regard to the processing of personal data and on the free movement of such data, and repealing Directive 95/46/EC (the General Data Protection Regulation) (hereinafter referred to only as the “GDPR”). The Joint Administrators process personal data only for the determined purpose, in the scope determined below and for the period specified in the concluded contracts or in the respective legislation. The Joint Administrators process personal data which is necessary for performance of contracts concluded between the administrator and data subject, for the purpose of implementation of the commercial relationship between the administrator and the data subject contained in the contract and for management of the relationship with the data subject. The administrator processes personal data on the basis of its legitimate interests, as well as on the basis of the legitimate interests of its partners and companies in the FINEP Group, if these interests are not outweighed by the interests, rights or freedoms of the data subject. The Joint Administrators also process personal data for analysis and improvement of the quality of their services, for market analysis and market research. The Joint Administrators will use personal data for creation of the relevant promotional campaigns and offers of the products and services of companies in the FINEP Group. data provided above the framework of the respective acts processed within the framework of consent granted by the data subject (processing of photographs, use of personal data for the purpose of HR procedures, cookies etc.). The Joint Administrators process personal data in a transparent, correct manner and in compliance with the GDPR. The data subject is entitled to access his/her data, to explanation and also has other rights if he/she believes that there is a problem with processing. The data subject may submit a complaint to the Office for Personal Data Protection. the right to refuse recording or monitoring of telephone calls with employees of the FINEP Group. The data subject is entitled to not provide his/her personal data to the Joint Administrators. If provision of this personal data is obligatory (by law or on a contractual basis), the Joint Administrators hereby warn the data subject that they will not be able to provide him/her services. governmental and other authorities within the framework of meeting legally determined obligations. The Joint Administrators have entered into an agreement in compliance with the provisions of art. 26 GDPR, on the basis of which they have mutually defined their responsibilities for meeting the obligations determined by the GDPR. information whether provision of personal data is a legal or contractual requirement and whether the data subject is obliged to provide personal data and also information about the consequences of failing to provide it. The Joint Administrators hereby inform the data subject that he/she is entitled to exercise his/her rights in accordance with the GDPR with each of the administrators and towards each of them. The Joint Administrators may hand over personal data to third countries outside of the European Economic Area, e.g. to the USA and Switzerland. If personal data is handed over to countries outside of the European Economic Area or to countries which do not have the appropriate level of protection in line with the valid legislation, in particular the GDPR and other EU regulations and national regulations on personal data protection, this handover shall be performed on the basis of an exception relating to the specific situation, or the Joint Administrators shall ensure that the appropriate guarantees are provided to ensure personal data protection in compliance with the GDPR, i.e. in particular in compliance with art. 42 para. 2 of the GDPR. and protection of persons present on the monitored premises, checking the course of accidents at the workplace, the creation of damage, checking circumstances of theft of items from the workplace and intruders breaking into the FINEP building. Records from the camera system are stored for a period of 14 days and are then overwritten in an automatic loop. No audio recordings are made and no software is used for comparison of certain biometric characteristics of data subjects (e.g. characteristic movement or gait of data subjects). “Cookies” are small data files used as unique identifiers. Each cookie file is unique to your web browser. The cookie file contains anonymous information and is sent from the server of the website you are looking at to your computer or mobile telephone. It will be saved on your device and only that server will be able to search for or load the content of that cookie file. Cookie files which are sent may be sent back to the website servers with updated data while you browse the website. Cookies are used by the vast majority of websites to ensure their operation. Cookie files may be set by the websites you visit (“our cookies”) or may be set by an organisation which is not the owner of the website you are browsing (“third-party cookies”). They may for example be set by another website which launches content on the website you are browsing or by an independent analytics company. The websites you visit may also include content inserted from other websites and these websites may also set their own cookies. Websites may use the advertising network of a third party for provision of targeted advertising. These cookies may have the option of monitoring your browsing of various websites. First-party cookies – their validity is limited to the domain of the website you are browsing. These cookies are regarded as safer. Third-party cookies – these are placed with the aid of a script from a different domain. The user can thus be tracked across domains. These are frequently used for evaluation of the effectiveness of advertising channels. Short-term session cookies – session cookies are saved only temporarily during the browsing session and are deleted from your device once the browser is closed. Long-term persistent cookies – This type of cookie is saved on your computer for a fixed period of time depending on your browser settings and cookie settings (usually a month, year or longer) and these cookies are not deleted once the browser is closed. Persistent cookies are used to identify you from one browsing session to another, for example for saving your preferences, so these will be remembered for your next visit. You can remove them manually. help us to improve the performance of our website allowing us to offer you a better user experience. The information provided using these cookies is anonymous and helps us to understand how our visitors use our website allowing us to improve presentation of our content. These services are generally provided by independent companies for measurement and research, so these cookies may be third-party cookies. Technical – first-party, short-term. These ensure the basic technical functioning of the website, i.e. login, remembering settings and use of services etc. Statistical and diagnostic (e.g. Google Analytics) – first-party, long-term. These are used for generation of anonymous statistics about use of the website. Advertising - first-party and third-party. These are used for behaviourally-targeted advertising by interest. If adverts really have to be displayed (as the main revenue for the website and creation of its content) the user/reader should at least be shown offers which really might be of interest to them. https://support.apple.com/kb/ph21411?locale=cs_CZ (for the Safari browser). You must however realise that if you block or delete cookies sent from our website which are absolutely essential or which ensure functioning or performance, it may be impossible to use the website. You can display the types of cookies used on our website and thus gain information on how to change the cookies settings or how to block the cookies used on our website. If you use the websites of our partners, a cookie file may be set by the websites you have visited. We do not operate these websites and thus have no control over distribution of these cookies. More information about these cookies can be found on the website of the respective third party. FINEP uses the following cookie files. All of the above-mentioned cookies are used only for the purpose specified in this table. If you have any queries or if you would like to exercise your rights determined by the GDPR, the Joint Administrators hereby provide their contact details which the data subject can use to contact them. Interest rate annual from 1.5 % p.a. For the purposes of this event, the Company is understood to be FINEP Premiѐre., s.r.o., with its registered offices at Trnavská cesta 6/A, 821 08 Bratislava, ID: 35 970 430, registered in the Commercial Register maintained by the District Court in Bratislava I, Division: Sro, entry no. : 40445/B (hereinafter “Company”). For the purposes of this event the real estate property is understood to be the still under construction Multi-function building PREMIЀRE, Šancová ulica, Bratislava“ (hereinafter “Property”). For the purposes of this event the draft agreement is understood to be the agreement (reservation agreement, or agreement on future agreement for the transfer of ownership right to an apartment or non-residential space (apartment or studio), or a similar agreement, which was sent to the Client (potential client), prior to the commencement of this Christmas event and the subject of which is also the obligation of the Company to reserve an apartment or a non-residential space (apartment or studio) in the Property, respectively, the subject of which is the Company's obligation to conclude an agreement with the client a contract for the transfer of ownership (purchase contract) for an apartment or non-residential premises (apartment or studio) in the Property following the fulfillment of the agreed conditions. The Christmas event is intended exclusively for new clients of the Company and does not apply to a draft contract in progress or an already concluded agreement (contracts being drawn up or concluded agreements or their prior agreed terms cannot be amended with respect to this offer) and exclusively concerns residential or non-residential premises (apartment or studio) specified by the Company. This Christmas event lasts from November 20, 2017 to January 31,2018 and is limited by the selling out of selected apartments and non-residential premises (apartments and studios), provided that the Company, as a discount provider, reserves the right to cancel this event without replacement even before the end of the above-mentioned period. FINEP SK a.s., Trnavská cesta 16076/6A, 821 08 Bratislava, www.finep.sk, info@finep.sk Company Id.No. : 35 931 914, registered in the Commercial Register kept with the District Court in Bratislava I, insert 3576/B, Section: Sa © 2009-2018 FINEP SK a.s. | All information and visualisations in the website are unbinding and serve for informative purposes only. We process your personal data in compliance with the GDPR.